Purpose: National data indicate that the oral health status of the aging population in long term care facilities (LTCF) is poor in the majority of cases. Nursing assistants are considered to be the primary caregivers of oral health care to elders residing in LTCF's. 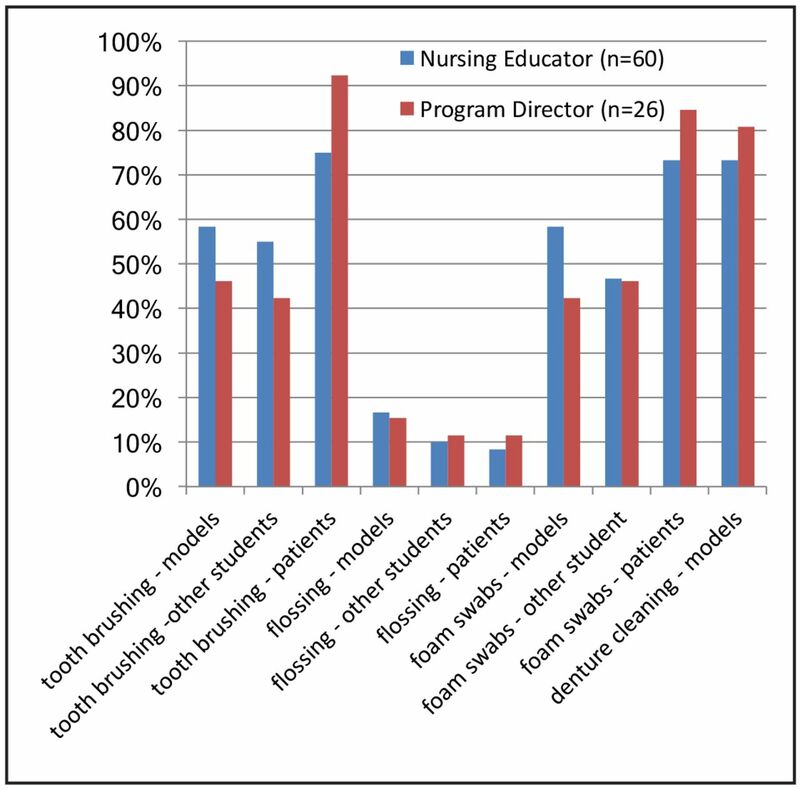 The aim of this research was to explore the perspectives among nursing educators and program directors on the adequacy of oral health education in nursing assistant curricula. Methods: This exploratory, cross-sectional study utilized a web-based questionnaire adapted, with permission, from a prior study conducted in 2009. The 17- question survey regarding the adequacy of oral health education, was e-mailed to 253 nursing educators and program directors in 71 locations in the New England area with an explanation of the study and a link to SurveyMonkey®. Results: Of the 253 surveys e-mailed, 100 surveys (n=100) were returned giving an overall response rate of 40%. Fourteen respondents (n=14) indicated that their program did not include oral health education in their curriculum and were excluded from the study. The remaining 86 participants (program directors n=26 and educators n=60) indicated that oral health education was included in their nursing assistant curricula. Respondents who reported spending more time on both didactic (P<0.001) and clinical instruction in oral health (P<0.001) were more likely to agree that the oral health care education provided in their program was adequate (P<0.001). Conclusion: The results indicate that the perception of nursing educators and program directors is that the level of oral health education within the nursing assistant curricula is adequate in preparing students with the skills and knowledge needed to provide oral health care to patients. Literature suggests there is an association between oral health and overall health.6-11 This association is most significant in the older adult population residing in institutionalized Long-term Care Facilities (LTCF) due to the increased incidence and prevalence of oral disease.12 Poor oral health affects one's quality of life in areas of speech, digestion, nutrition, social interaction, and overall well-being.13 Adequate oral hygiene practices play a significant role in the maintenance of good oral health.11 The preservation of oral health is a vital component in the maintenance of the overall health of the elders in LTCF. Two studies identified that education in oral disease, oral health, and dental hygiene as major barriers in providing adequate oral care to residents in institutionalized settings, such as LTCF.8,19 In the United States, nursing assistant curriculum is regulated by the Code of Federal Regulations (CFR) 42, Part 483.20 This regulation specifies that nursing assistants must be trained in “grooming- including mouth care” but is not detailed as to exactly what training must be included for mouth care.20 While nursing assisting curricula must adhere to the federal regulations, each state's Board of Nursing (BON) ultimately approves the individual nursing assistant program curriculum using the standards for nursing skills approved by the Accreditation Commission of Education in Nursing (ACEN) and the Commission on Collegiate Nursing Education (CCNE) as a guide.21,22 Accreditation standards for nursing curricula require the inclusion of integration of preventive health promotion strategies, including oral health screenings; however, nursing assistant curricula includes very little in oral health education.12,21 With increasing evidenced- based research identifying the link between oral health and overall health, nursing assistant program curricula should be modified to include a more comprehensive oral health education component.19,23,24 Incorporating evidenced-based oral health education and best practices within nursing assistant curricula will further the understanding of the importance of oral health care for the older adult population and extend beyond the actual process of how it should be performed.7,8,12,19 Closing the gap regarding the adequacy of oral health education among nursing assistants is an area that requires further attention and has the potential of eliminating lack of education as a barrier to providing adequate oral health care.5,8,19,25 The aim of this study was to explore the perception among the nursing educators and nursing assistant programs directors on the adequacy of oral health education in the nursing assistant curricula. A convenience sample of 253 program directors and nursing educators of nursing assistant programs located in the New England geographical region of the northeastern United States (Connecticut, Maine, Massachusetts, New Hampshire, Rhode Island and Vermont) was solicited for study participation between February 1, 2015 and February 28, 2015. Inclusion criteria were being a program director or educator of a nursing assistant program in New England. Exclusion criteria were participants representing nursing assistant programs lacking an oral health component in their curriculum. Potential participants were contacted from email addresses obtained on websites of educational institutions and facilities with nursing assistant programs located in New England. The email invitation provided information about the study and included an electronic link to the survey instrument using SurveyMonkey®. Follow-up emails were sent detailing the same information during the second, third and final week of the survey. This study received approval from the Massachusetts College of Pharmacy and Health Sciences (MCPHS) University Institutional Review Board. The survey instrument was modified, with permission, from a 2009 study by Samson, et al.26 Content validity was established by a panel of five experts.27 The 17-item questionnaire was subsequently piloted with one program director and three nursing assistant program educators from New England for clarity and comprehension. The questionnaire included demographic questions about the role and professional background of the participant; characteristics of the oral health education program including the inclusion of oral health in the curriculum, number of didactic and clinical hours spent on oral health education, types of clinical experiences, evaluation of students' knowledge and type of educational institution. Three open-ended questions regarding educational materials used, instructor/student ratio during clinical instruction and recommendations for improvement of the oral health component of the nursing assistant curricula were added to the end of the survey. Survey responses to categorical questions were enumerated using frequency percentiles and summary statistics. Differences in select categorical question responses across position type (program director; nursing educator) were assessed via ANOVA and Fisher's Exact Test.28,29 Associations between select categorical questions and Likert scale questions were assessed using Fisher's Exact Test and Nonparametric Spearman Rank Correlation Tests.29,30 All statistical tests were performed at an alpha threshold of 0.05. All statistical analyses were performed in STATA® statistics/data analysis software version 11.2. Overall, the characteristics of the oral health education programs were comparable between program directors and educators without any statistically significant differences. (Table I) Sixty percent of participants indicated that oral health objectives were outlined in their program, with 81% reporting that oral health education was provided in both didactic and clinical settings. The greatest number of respondents (38%) reported spending 1 to 2 hours for the didactic portion and clinical portion of their oral health program. Ten percent reported spending more than three hours on the didactic portion and while 14% reported spending more than three hours on the clinical portion. Eighty-six percent of the respondents reported that their students received feedback during clinical instruction. With regards to student evaluations of oral health knowledge, 77% utilize both written and clinical evaluations in their program, 1% reported written only and 9% reported clinical only. Regarding the educational materials utilized, 92% use a nursing assistant textbook, 8% utilize videos/DVD's, 6.7% incorporate online resources and 6.7% use no specific materials. As a follow-up question to the above two statements, participants were asked if they had any recommendations for improvement to the oral health education in their curricula, 66% had recommendations including the following: 32% recommended more time, hours and/or practice; 13% recommended the curricula include education on the oral-systemic health connection; 2.7% recommended instruction with either dentists or dental hygienists, and 4% were unsure. In any curriculum, it is important to specify educational objectives for both students and educators to allow for proper instruction and learning.32 This study demonstrated that only 60% include oral health care education objectives in their syllabi. While most of the participants noted the use of a nursing assistant textbook and some the use of instructional videos, several noted there were no specific educational materials used for oral health education. 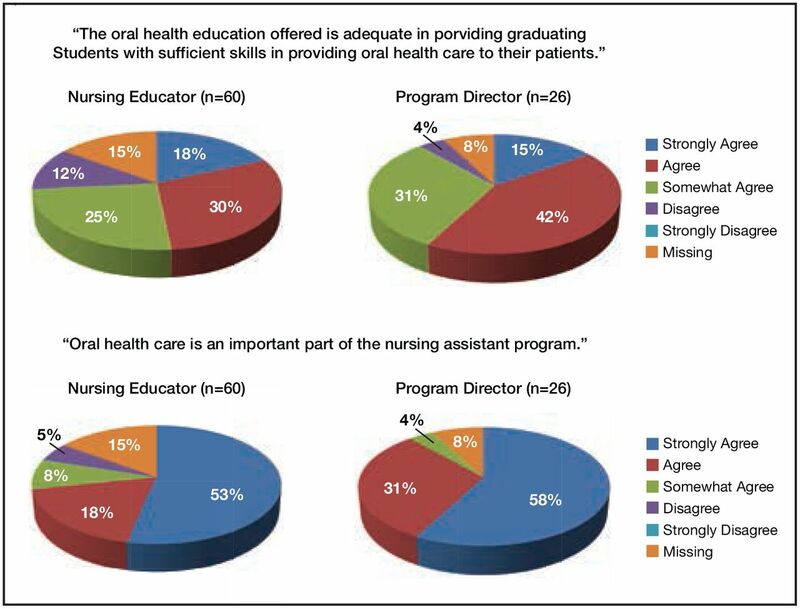 Inadequate training and education have previously been identified as barriers to care by the caregivers, however, this study showed that the perception of program directors and educators of nursing assistant programs is in contrast.9,17 Overall, while 50% of the educators and program directors felt that oral health education is an important part of the nursing assistant curricula, less than 20% strongly agreed that the education received was adequate. A review of the various types of educational facility/institutions the participants were affiliated with shows that community colleges represented 25.3%, technical colleges 2.7%, private facilities 1.3% and nursing homes 10.7%, while 60% of the remaining participants responded to the “other” category. Of those in the “other” category, 40 of the respondents reported being affiliated with a technical high school. These findings suggest a large majority of the students in those programs are between the age of 16-18. In many instances, this adolescent population may have unmet oral health needs of their own which further supports the importance of an adequate oral health education component in the nursing assistant curriculum.33,34 Educating this student demographic with an emphasis on the importance of oral health, plays a vital role in teaching the necessary skills for the provision of adequate oral health care to the elder population. As the dental hygiene profession continues to evolve and progress, the findings of this study further support the need for interprofessional collaboration among healthcare providers for the betterment of oral health. As the integration of Certified Public Health Dental Hygienists (CPHDH) increases, the implications of this study further support the need for LTCF to allow for the CPHDH position on a full-time basis. In addition, dental hygiene educators teaching at institutions offering a CPHDH curricula would benefit from incorporating these statistics to signify what types of oral health education, didactic and clinical, is being taught in nursing assistant programs. Limitations of this study included the absence of a demographic question regarding the particular state in which the participant's program was located and a question regarding the total number of required hours for the participant's nursing assistant program. Also, results from the New England states may not necessarily reflect areas outside of this region. 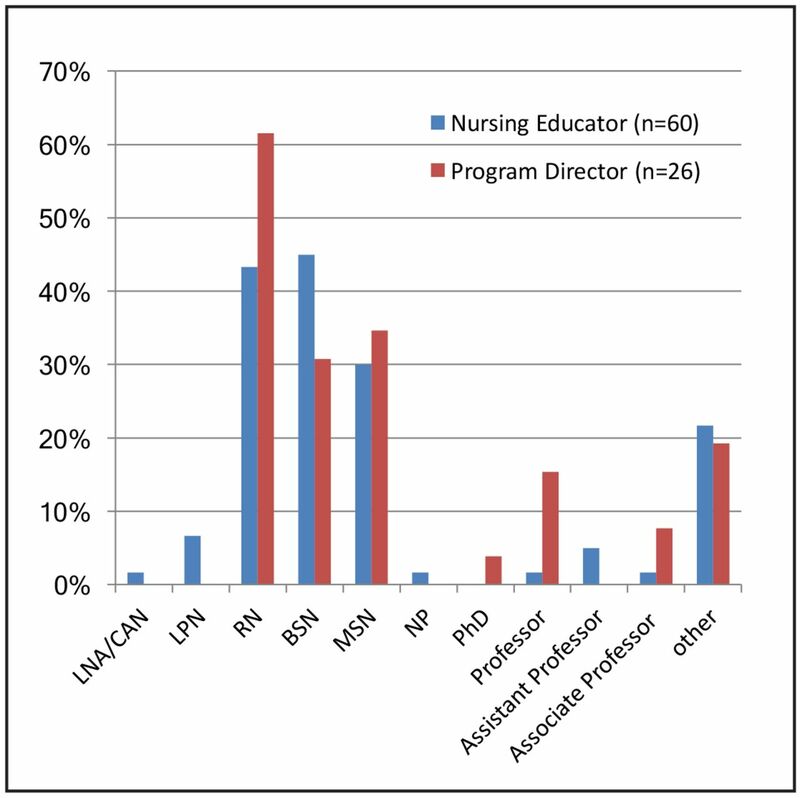 Furthermore, this study had a relatively low (40%) response rate so these results cannot be generalized to represent the total population of program directors and educators of nursing assistant programs. Lastly, the responses to the questions using the Likert-type scale may have produced vague data due to the interpretation the response may have elicited. 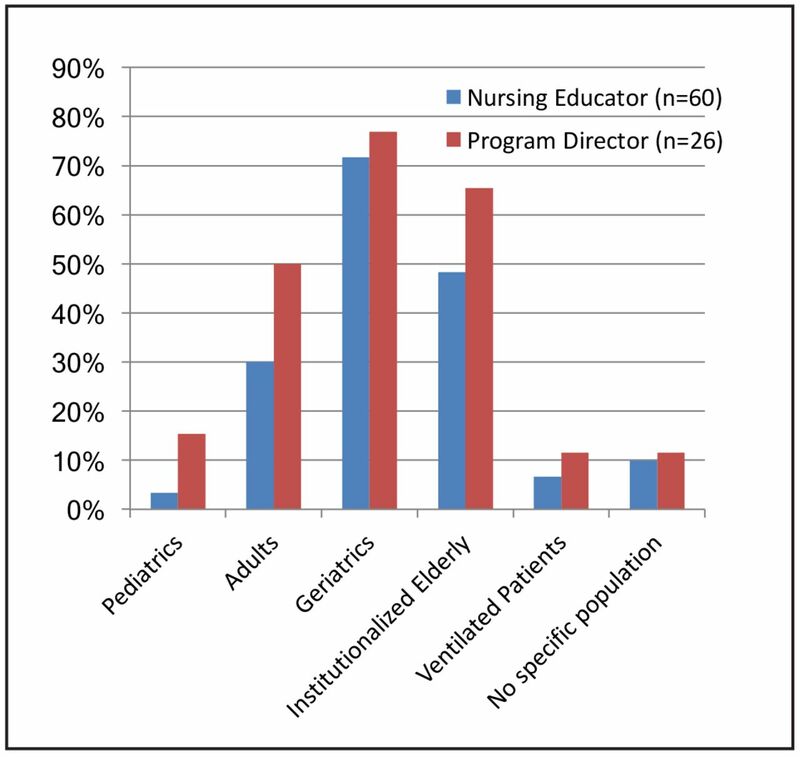 While the data collected regarding the total number of hours spent on didactic and clinical oral health education appears to indicate that there is room for improvement in these areas, the perception of the program directors and educators is that the amount of time currently provided for oral health education is adequate in nursing assistant curricula. Based on the individual recommendations of the study participants, continuing efforts to increase the length of time spent on oral health education and incorporating evidenced-based information for educating students on oral-systemic health connections, will create the foundation for increased knowledge and awareness of the importance of oral health for the institutionalized elder population. Future research should include assessing the nursing assistants' perception on the adequacy of the oral health care education received during their training, as well as their recommendations for improvement. Moreover, in-depth explorations of the perceptions regarding the value of oral health among nursing assistants, program directors and nursing educators would provide unique perspectives in identifying specific areas of development needed to update the nursing assistant curriculum standards and provide solutions to improve oral health outcomes among the elder population in Long-term Care Facilities. Barbara A. Stowers RDH, MS, is graduate of the Master of Science in dental hygiene at the Massachusetts College of Pharmacy and Health Sciences University, Boston, MA and is an associate professor in the allied dental education department at NHTI-Concord's Community College, Concord, NH. Lori Giblin, RDH, MS, is an associate professor; Lisa Laspina RDH, MS, is an assistant professor; Kristeen Perry RDH, MS, is an assistant professor; all at the Forsyth School of Dental Hygiene, Massachusetts College of Pharmacy and Health Sciences University, Boston, MA.
. Change in oral health status among the institutionalized Norwegian elderly over a period of 16 years. Acta Odon Scan. 2009 Jul 02;66(6):368-73.
. The practical oral care video - evaluation of a dental awareness month initiative. Aust Dent J. 2005 Jun;50(2):75-80.
. Oral health care education and its effect on caregivers' knowledge and attitudes: a randomized controlled trial. Community Dent Oral Epidemiol. 2002 Apr;30(2):91-100.
. Effect of professional oral health care on the elderly living in nursing homes. Oral Surg Oral Med Oral Pathol Oral Radiol Endod. 2002 Aug;94(2):191-5.
. Attitudes and perceptions towards oral hygiene tasks among geriatric nursing home staff. Int J Dent Hyg. 2011 Aug;9(3):199-203.
. Effect of a person-centered mouth care intervention on care processes and outcomes in three nursing homes. J Am Geriatr Soc. 2013 Jul;61(7):1158-63.
. Oral health considerations for the elderly-problems and management strategies. Indian J Dent. 2013 Sep;4(3):145-51.
. Oral health care in older people in long term care facilities: A systematic review of implementation strategies. Int J Nurs Stud. 2013 Apr;50(4):569-82.
. The importance of oral health in long-term care. J Am Med Dir Assoc. 2009 Nov;10(9):667-71.
. Status of oral healthcare in long-term care facilities. Int J Dent Hyg. 2003 Aug;1(3):169-73.
. Muted dental voices on interprofessional healthcare teams. J Dent. 2011 Dec;39 Suppl 2:S34-40.
. Improving residents' oral health through staff education in nursing homes. Spec Care Dentist. 2012 Nov-Dec;32(6):242-50.
. Oral care provided by certified nursing assistants in nursing homes. J Am Geriatr Soc. 2006 Jan;54(1):138-43.
. Oral health care for the elderly: More than just dentures. Am J Public Health. 2004 May;94(5):698.
. Dental hygiene education for nursing staff in a nursing home for older people. J Adv Nurs. 2010 Jun;66(6):1273-9.
. CCNE standards and professional nursing guidelines [Internet] Washington,DC: Commission on Collegiate Nursing Education; 2013 [cited 2013 Nov 17]. Available from http://www.aacn.nche.edu/ccne-accreditation/standards-procedures-resources/baccalaureate-graduate/standards.
. Good oral health is essential for good general health: The oral–systemic connection. Clin Micrbiol Infect. 2007 Oct;13(S4):1-2.
. Oral infections and systemic disease—an emerging problem in medicine. Clin Micrbiol Infect. 2007 Nov;13(11):1041-7.
. Opportunities for nursing-dental collaboration: Addressing oral health needs among the elderly. Nurs Outlook. 2005 Jan-Feb;53(1):33-9.
. Oral care training in the basic education of care professionals. Gerodontology. 2010 Jun;27(2):121-8.
. Statistical models: Theory and practice. 1st ed. Cambridge: University Press, 2005.
. On the interpretation of x2 from contingency tables, and the calculation of P. J of Roy Stat Soc. 1922 Jan;85(1):87-94.
. Tests for rank correlation coefficients I. Biometrika. 1957 Dec;44(3/4):470-81.
. An evidence-based oral hygiene education program for nursing staff. Nurse Educ Prac. 2011 Jul;11(4):256-9.
. Designing and assessing courses and curricula, a practical guide. 3rd ed. San Fransisco: Jossey-Bass;c2008. Chapter 13. Clarifying instructional goals and learning outcomes;147-9.
. Perceptions of oral health, preventive care, and care-seeking behaviors among rural adolescents. J Sch Health. 2014 Dec;84(12):802-9.